Any departure from the following should be considered a fault, and the seriousness with which the fault should be regarded should be in exact proportion to its degree and its effect upon the health and welfare of the dog and on the dog’s ability to perform its traditional work. The Welsh Hound is also known as the Welsh Foxhound and Welsh Bytheuad. It is an ancient breed, thought to be descended from the extinct Celtic Hound and the old Staghound. Organized Hunts have kept well-known packs of pure Welsh Hounds for nearly 200 years. 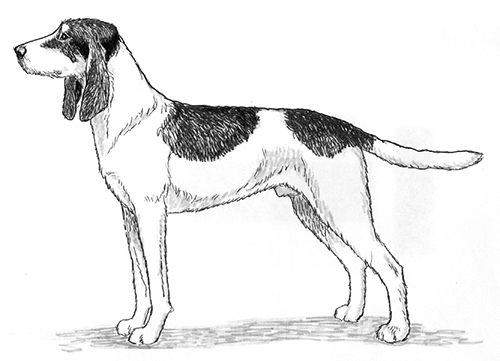 The Welsh Hound was recognized by the United Kennel Club January 1, 2006. The typical Welsh Hound is a low-scenting dog, with good shoulders, and a talkative, “loud” bark, being a prerequisite of hunting in the windy Welsh hillsides. Sturdy, independent hunters, self-reliant in the rugged and rocky Welsh hills. Intelligent, loyal and happy. The Welsh Hound has a complete set of evenly spaced, white teeth meeting in a scissors bite. Disqualifications: Undershot bite. Overshot bite. The skull is slightly domed at the occiput. The cranium is broad and full. The stop is moderately defined. The straight, square cut muzzle is of fair length. The long ears are set on moderately low, are almost absent of any erectile power, and set close to the head. The neck is long, slightly arched and well developed without being coarse. The long, well-sloped shoulders are well clothed with muscle, especially at the points, without being heavy. The forearm is long and muscular, but free from fat or lumber. The well-let-down elbows are set quite straight, and turn neither in nor out. The forelegs are long, straight and well boned down to the feet. The pasterns are strong. The chest is deep and the ribs are well sprung. The back is broad and level and there is a slight rise over the strong loin. The hindquarters are powerful and muscular. The hind legs are well boned down to the feet. There is moderate turn of stifle. The hocks are well let down. Round, tight, strong and well padded. Well set on high, carried gaily but never curled over the back. Rough and dense; of medium length. Occasionally smooth. Black, fawn, red, tan, white and mixed. Free striding and tireless, with the ability to gallop. Strong drive from behind with no tendency to roll.